ANZAC Day is a big freakin’ deal in Australia. 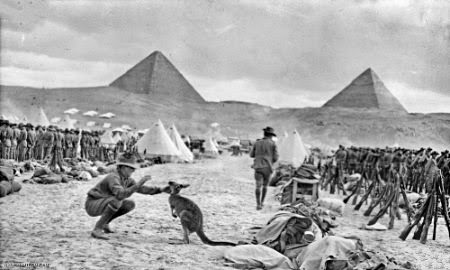 And this year is particularly significant as 25 April 2015 marks the 100th anniversary of the Australian and New Zealand forces’ landing at Gallipoli. For those who are rusty on Australian WWI history and who would appreciate a quick primer the Australian War Memorial does a good job explaining it all here. These are the ANZACs. But why’d they take a kangaroo to Egypt? So, a few days ago a feed came across my Facebook page linked me to a page outlining the importance of providing warm socks to the soldiers during the Great War (wha?? So random, right? Stay with me). You see clean, dry, warm socks were incredibly important to the diggers. Trench Foot was a real and horrifying medical condition brought on by the damp, unsanitary and cold conditions in which the soldiers found themselves. You could literally die from all the crud you were standing in day and night! The details are too gory to describe here but Wikipedia is happy to tell you (and show you) all about trench foot. Ugh. Awful. But trench foot could be prevented by regularly switching out wet socks for dry – but there were just never enough to go around. So the Red Cross put out the call for those left at home to knit socks for the troops. Women (mainly, although some men and boys too) from all over the country took up their needles and hopped to it. Schools, churches, womens’ guilds, boy scout and girl guide troops all came together to provide some comfort to Australian troops by knitting and sending them socks. 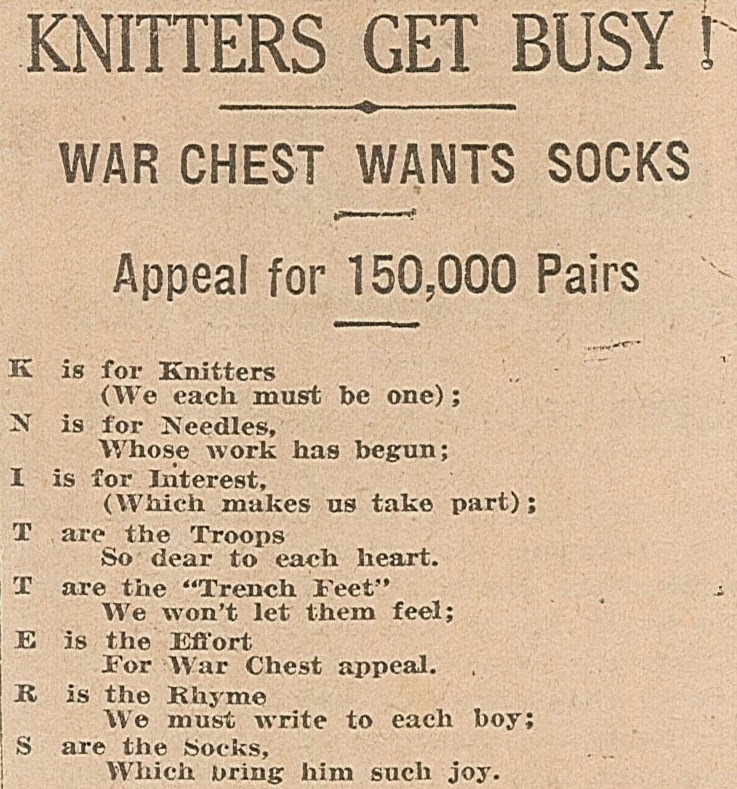 More than 1 million pairs of socks were knitting during the war. 1 Million!! Incredible! Love this acrostic poem. Can’t find the citation though, sorry. As a tribute during the centennial, the City of Sydney has organised Socks for Centenary (terrible name, btw) and is asking people to knit a pair of socks, following the official Red Cross pattern from 1914, and send them in to be a part of an ANZAC Day art installation in Surry Hills library. Once the exhibit ends all the socks will be donated to the Weyside Chapel in Kings Cross. 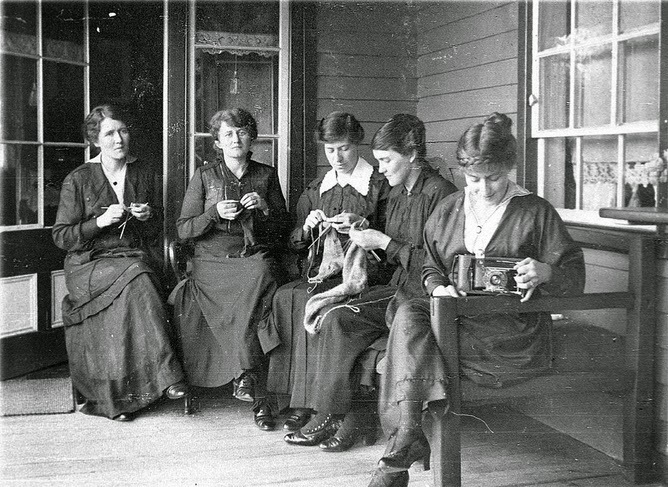 Women knitting for the war effort. Fancy new camera she has there on the right. Fabulous concept. Awesome! But why am I telling you all this? Because this has all really moved me. You see, my Great Grandfather, Pvt Edgar Gibbons, fought in WWI. I remember him fondly for his gentle nature and cheeky sense of humour but I was a young teen when he passed away and I didn’t get a chance to ask him about his war memories. Fortunately, his war records are available online though through the National Archives (isn’t that amazing?) and reading them gave me a whole new appreciation for the sacrifices so many made to fight for King and Country. Family lore has it that he was gassed in the trenches and evacuated to hospital in London. There he met and fell in love with his Scottish nurse, married her, and brought her back to Australia (told you he was cheeky!). She was my Great Grandmother and I still use her shortbread recipe that was handed from her, to my Grandmother, and down to me.My Great Grandpop was just 18 when he enlisted, having lied about his age to sign up, and he served in the 5th Australian Light Trench Mortar Battery in France and Belgium between 1916-1919. When I think of the deplorable conditions and read of his many illnesses and injuries I wonder how anyone could ever survive such a hellacious experience, much less someone I actually knew and loved. No wonder handmade socks with kind letters of encouragement pushed into the toe were so welcomed and valued by a digger. I like to think that maybe someone might have knitted some new, warm, socks and sent them to him to help ease some of his discomfort. To be so young, so far from home, and in such a horrible situation. Heartbreaking. Now for the knitting. 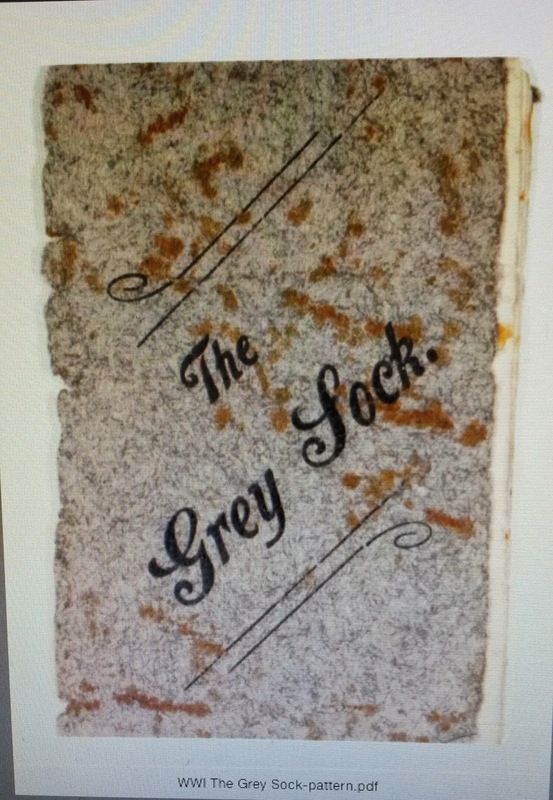 As part of the Socks for Centenary project the original 1914 ‘The Grey Sock’ pattern has been digitalised by the Mitchell Library and made publicly available – here. 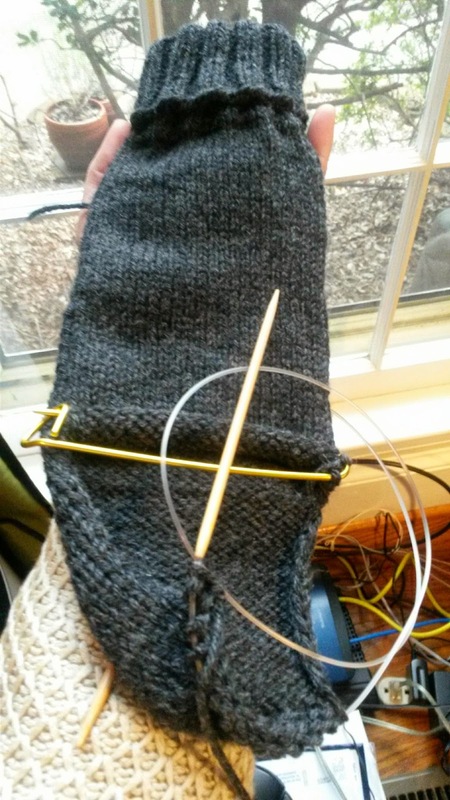 Just finished turning the heel. Now for the foot. Clearly NOT historically accurate since I’m using non-period magic loop technique and circular needle, fancy stitch holder AND all the computer, modem, and router cords are clearly visible in the background, but still it is coming along nicely. And I have to say it really is so warm and soft and snuggly. Very comforting for a young soldier on the Western Front I would think. Anyone else like to try knitting WWI era socks from an original pattern? Truly, it’s not that scary! If you would like to have a go all the instructions can be found here at the Socks for Centenary webpage. Once your beautiful socks are finished just complete the participation form found here and then send them on to any of the City of Sydney public libraries to be displayed in honour of someone you love or loved who served to protect our freedoms. Deadline for submission is 27 March 2015. If you live somewhere other than Sydney you can just post them in to one of the Sydney libraries along with the participation form. That’s what I’m going to do. Don’t forget to leave a comment and tell me all about it!